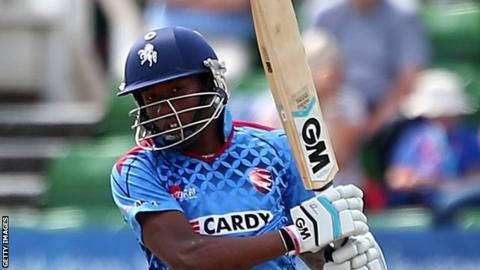 Kent openers Daniel Bell-Drummond and Joe Denly both hit half-centuries to lead their side to a five-wicket win over Hampshire in the One-Day Cup. Bell-Drummond (80 not out) and Denly (78) shared an opening stand of 131 after being set 234 to win. Alex Blake smashed two sixes in his 34 not out as Kent reached 236-5. Earlier, Michael Carberry made 61 as he shared a first-wicket partnership of 80 with Jimmy Adams (47), but Hampshire collapsed to 233 all out. Kent's slow left-armer Fabian Cowdrey, who only had five domestic one-day wickets before the match, helped to bring about the demise of Hampshire's innings with career-best figures of 3-32. Bell-Drummond then missed out on surpassing his limited overs best of 83, after Blake took the attack to the bowlers and scored the majority of the runs in their half-century stand. "If we can get the first powerplay right, do things better up top than we did today, then we can be a proper side in this format. The guys did so well to drag us back into things. "The run chase went fairly smoothly thanks to Danny [Bell-Drummond], who again showed how his one-day game is maturing when opening up alongside an experienced campaigner like Joe [Denly]. "Those two laid the foundations and made life pretty comfortable for the rest of us."